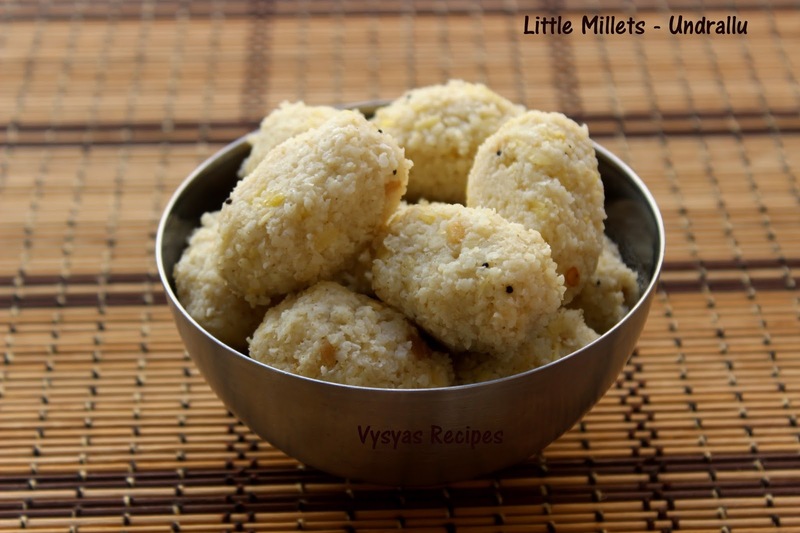 Vysya's Delicious Recipes: Samai Upma Kozhukkatai - Little Millet Undrallu - Millets Kara Kadubu. 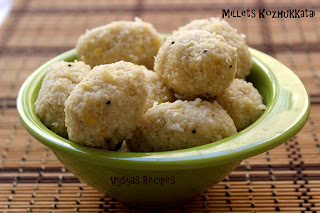 Samai Upma Kozhukkatai - Little Millet Undrallu - Millets Kara Kadubu. Millets Kara Kozhukkatai is a healthy breakfast or Dinner recipe made with Millets of your Choice. I used Little Millets to make this kozhukkatai.It is also known as (Hindi: Kutki; Tamil: Samai; Telugu: Sama; Kannada: Same; Malayalam: Chama).High fiber levels in millet make for an ideal cholesterol-lowering approach.Millet is a grain that should also be included on your list of heart-healthy choices because of its status as a good source of magnesium.Today we will learn to make Millets Upma kozhukkatai or Millets Undrallu. Soak the saamai Rice for 1/2 an hour in water. Grate the Coconut & keep it aside. Heat the oil,add mustard seeds, when it splutters add urad dal,Red chillies, & curry leaves. When urad dal turns Golden brown colour, add hing, give a quick mix. Now add moong dal & 1/2 cup of water. Let it cook for 5 minutes. Then add 2 cups of water. When water starts boiling, drain the water & add samai.Cook in medium flame. When water was almost absorbed, add grated Coconut give a quick mix. Switch off the flame,when all the water is absorbed. When it is warm, grease your hands with oil & hold oval shaped dumpling or as balls, as you desire. Then Grease idli plates or steaming plates, arrange kozhukkatai carefully on it & steam cook for 12 - 14 minutes. Serve hot with any chutneys. 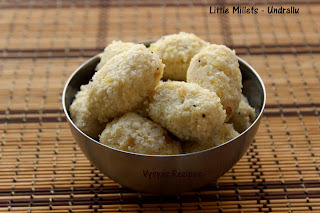 I used Samai arisi to make kozhukkatai,you can use varagu,thinai or kuthiraivali millet. Soaking the millets gives softness to kozhukkatai. Always serve hot, else it becomes dry. Healthy and yummy kozhukattai!! lovely evening snack! !